There is a plan to create a massive northern forest in the UK. There is a logic behind this in that the UK has only some 13% woodland / forest cover. This is low as compared to the european average. More trees will result in more carbon dioxide being absorbed from the atmosphere, helping with global warming, and also helping the Government meet its 2050 carbon emissions targets. The trees will also hopefully enhance the environment, providing habitats and niches for many plants and animals; including us, offering places to walk and unwind. Generally improve the environment in which people live and be the legacy of the current generation for those of the future. 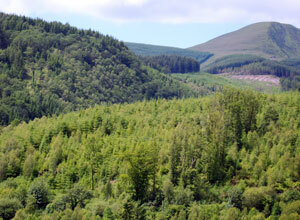 However, the creation of new woodland or forest is not a ‘simple task’. Large scale tree planting ‘took off’ soon after the First World War. Woodland cover then had fallen to an all time low of 5% (in Britain) and the Forestry Commission was established. This had the aim of ensuring that there would be a strategic reserve of timber. To this end, vast areas of ‘low grade’ land were pressed into service. Tracts around Thetford and Kielder were used, as were some sandy coastal sites (e.g. Holkham in Norfolk) and large areas in Scotland (including the use of some natural peatlands). 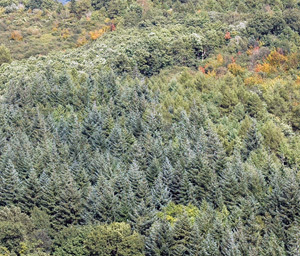 Coniferous plantations were planted, using introduced species such as Douglas Fir, Corsican Pine, Sitka Spruce and Larch (though this is a deciduous). These often sit as dark, regular, ‘rectangular’ blocks of almost uniform colour in the landscape – as natural as any other monoculture! The provenance of the ‘whips’ - where they have come from. A lot of material is imported and there is a risk of pests and disease. Isabella Tree has proposed that the creation of new woodlands and forest can also be achieved by more natural means, rather than the extensive use of wholesale planting. For example, by learning to love ‘thorny scrub’. 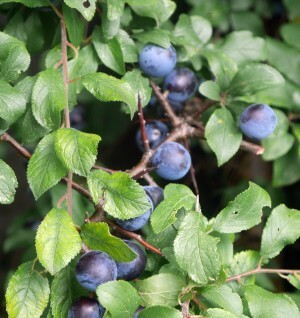 In the past, scrub was valued to quote “as a nursery for trees”; or as foresters in olden times might have said “the thorn is the mother of the oak”. The ‘ingredients’ of scrub [hawthorn, blackthorn, gorse, bramble etc] are a natural form of barbed wire, offering protection from browsing animals such deer, they also create a micro-environment which limits the extremes of temperature, rain and wind. 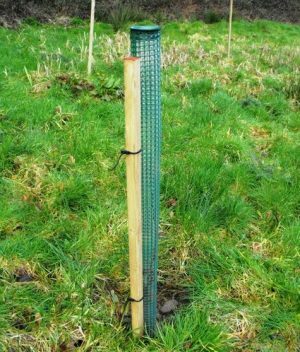 The planting of trees and shrubs could also been achieved (at least in part) through the natural dispersal of fruits and seeds; dispersal can occur by the wind (think, Ash or Sycamore) or through the agency of animals (squirrels and birds). Birds like the Jay can carry several acorns in the gullet, taking them to bury as a winter store. Others take seeds which pass through their gut ‘unharmed’ and deposited elsewhere in their faeces. She has also suggested that the new forest should be more like that of the New Forest and the hunting forests of mediaeval times, in which trees regenerate in open glades - within thorny scrub. A mosaic of open grown trees (such as beech and oak) of varying ages, open spaces of glades and rides offering opportunities for light loving species of both tree and flowers.